La Perla, a unique centre in Europe, makes use of seawater to offer the best relax therapies and body toning programmes. La Perla Thalassotherapy is a genuine heir of the belle époque of San Sebastian. More than one century ago, the queen Maria Cristina established the royal summer house in this city. 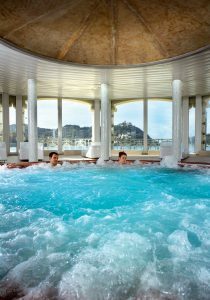 Sea baths were considered to be a fine pleasure by holidaymakers, a pleasure that combined therapy, relax and wellness.